While the App Store has been stealing all the headlines for Apple in terms of downloads in recent times, iTunes has bitten back with its own landmark. Apple has set up another countdown on its site to show how many songs are being downloaded worldwide, as the target hurtles towards 10 billion. It might not have the speed of the App Store behind it (three billion apps in 18 months) but in the seven years it's been alive, iTunes is still proving to be one of the most popular places to download tunes. 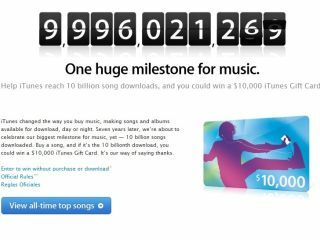 And to mark the occasion, Apple is giving away a $10,000 (£6740) iTunes gift voucher for the lucky billionth downloader. Although we have absolutely no idea how you could ever spend $10,000 on iTunes downloads without getting seriously bored. However, with the 10 billion download mark less than 3 billion away, you could invest in downloading as many songs as possible from now until the 10 billion mark is reached – and even if you don't win, you'll know Jobs is watching you and is proud.